Middle East envoy for the Obama administration and former U.S. Senate majority leader, George Mitchell has earned a reputation as “a diplomat capable of untangling the world’s knottiest disputes”. Mitchell has served as a director of the Walt Disney Company, Federal Express Corporation, Xerox Corporation, and Unilever, Staples, Inc., Starwood Hotels and Resorts and the Boston Red Sox baseball team. In 2006, he was asked by the Commissioner of Baseball to lead an investigation of the use of performance-enhancing drugs in professional baseball. 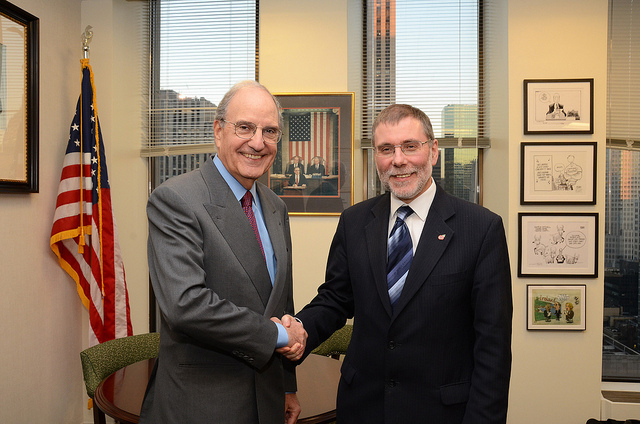 In addition to the Presidential Medal of Freedom, Senator Mitchell has received awards and honors including the Philadelphia Liberty Medal, the Truman Institute Peace Prize, the German Peace Prize and the United Nations (UNESCO) Peace Prize.